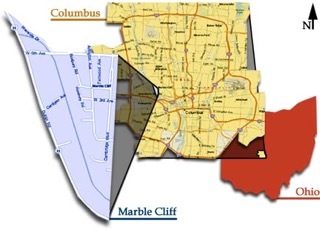 The Village of Marble Cliff requires helmets for all children under the age of 18 who are riding their bike or other forms of transportation such as bike trailers and scooters in the Village (this is the same requirement in effect in Grandview Heights; the Village recognizes the Grandview Heights Traffic Code by legal reference as the traffic regulations for the Village). The Village supports bicycling in the community. The Scioto Greenways Path along Dublin Rd., the multi-use path from Dublin Rd. to Arlington Ave. and the bike friendly streets in the Village are all an effort to promote bicycling as a healthy mode of transportation. Walk-ability and safe streets are important to our community. According to the American Academy of Pediatrics (AAP), bike helmets are the single most effective way to reduce head injuries and fatalities resulting from bike crashes, with proper helmet usage having been demonstrated to reduce the risk of head injury by 85%, severe brain injury by 88%, and bicycle related fatalities by 75%. AAP provides several tips for getting your children to wear their helmets such as: start the habit early, wear a helmet yourself, and talk to your kids about why it is important to wear a helmet. It is also important to wear a helmet that fits properly. This guide can help walk parents through proper fit of a helmet or you can watch this video.